On February 11th, Congressman Keith Ellison came to speak to Georgetown College Democrats about how optimistic young leaders can shape and effect change. The talk, followed by a lengthy Q&A, may have gone long, but remained engaging and interesting throughout. 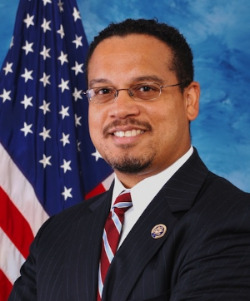 While Ellison by no means minimized the large structural problems facing the United States, he focused on the more positive arc of U.S. history. Ellison summarized his position when he said, "Whenever young people that I encounter think that it is somehow sophisticated to assume the worst and that nothing’s going to go right it makes me a little sad, because if the youth aren’t idealistic and the youth don’t feel like the world can be a better place heaven help the rest of us"
For more info, you can check out The Hoya's article on the event here.